For much of human history that wasn’t a particularly easy question to answer, but for many of us today it’s a simple matter of consulting our phones. The same Global Positioning System technology that helps you locate your lost iPhone also makes it possible for you to pinpoint yourself on a map. And therein lies a minor mystery of the GPS era that University of Virginia astronomy professor Kenneth Seidelmann and a team of co-authors investigated in a paper in the Journal of Geodesy. The Royal Observatory in Greenwich, England, is famously home to the line of 0 degrees longitude—the imaginary north-south line that, in the imaginary grid of longitude and latitude that circles the Earth, divides the Eastern and Western hemispheres of the globe. Known as the Greenwich meridian, or prime meridian, the line was established at an international conference in 1884 as the “initial meridian” from which all other lines of longitude would be calculated. 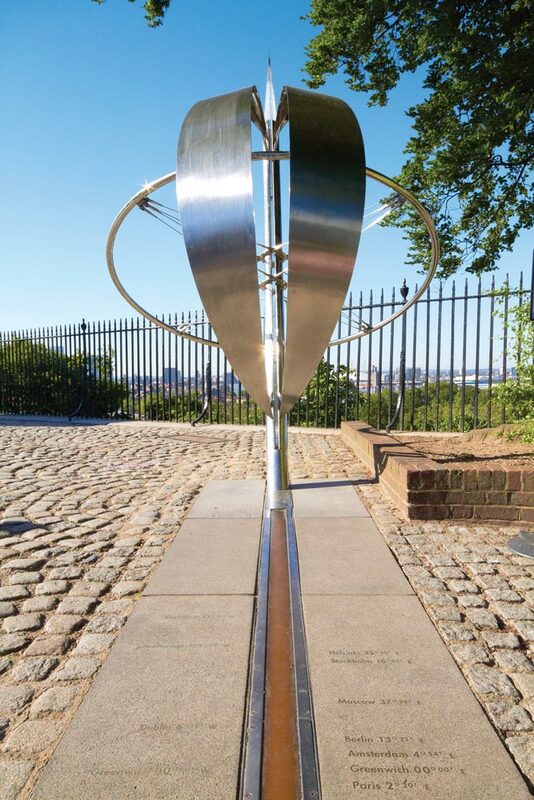 Today the Royal Observatory draws hundreds of thousands of visitors each year to straddle the marker that traces the line, one foot in each hemisphere. This anomaly is no secret. GPS (and Google Earth) will direct you some 102 meters to the east, where the actual line of 0 degrees longitude crosses a nondescript footpath and unceremoniously skirts a waste bin. “Our principal question was, if it’s off at Greenwich, is everything off around the world? Had the whole system rotated?” In other words, if the new meridian at Greenwich is 102 meters to the east, had every other line of longitude moved as well? “That was where I had some fun,” Seidelmann says. And some old-fashioned legwork came into play. He asked contacts all over the world to take a GPS reading at locations where precise coordinates of longitude and latitude had been established from astronomical instruments before GPS was introduced. Will anything change at Greenwich? Probably not. For technical purposes, the displacement of the prime meridian by 102 meters is not meaningful, particularly given that, as Kenneth Seidelmann notes, the whole system of longitude hasn’t rotated. The correction is still fairly localized. Plus, the current GPS system maintains a constant process of micro-adjustments based on things like the slow but inexorable movement of Earth’s crust. Nothing is static. Seidelmann’s team concluded that the entire system had not rotated—the Greenwich anomaly was a local phenomenon. In the process of determining longitude, scientists have to establish a line vertical to the surface of the Earth. Every location has its own “local vertical,” due to variations in gravity—the pull toward bodies of great mass—because the Earth’s surface is uneven. But while 19th-century means of determining vertical were subject to those local variations, today’s GPS and other technologies more accurately make calculations globally, with reference to the Earth’s center of mass. The difference between these two means is known as the “deflection of the vertical,” which, Seidelmann’s team found, explained how the prime meridian had shifted east.